Once an Implant has been placed, an abutment is fitted to hold the Crown. The abutment and the base of the crown may be metal. However, in certain light, this can make the tooth look dull. An alternative is for the abutment to be made of white material and the Crown made of solid porcelain. This will give a more natural look to the tooth. The broken or decayed tooth is prepared. An Inlay is made and fitted to the tooth. White or Gold inlays are available. Depending on the extent of the repair required, sometimes the full top surface of the tooth is removed. A Full Onlay is then produced to replace the biting surface. Grinding the teeth can cause wear. The canines and the front incisors wear first. The enamel can be lost exposing the soft dentine underneath. At Barkingside Dental Care, we offer mouth guards and splints to prevent damage to the teeth. Depending on the problems you are having, it can be possible to spot the signs of an occlusal problem. Various muscles may be sore when tested, or the broken and worn areas of your teeth will show you are grinding your teeth - a common sign of an incorrect bite. 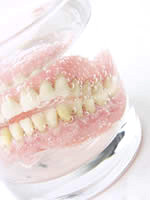 At Barkingside Dental Care, if we suspect that your problems are due to an incorrect bite, we would supply a temporary soft nightguard or hard plastic appliance that fits over your upper or lower teeth. This appliance needs to be measured and fitted very accurately so that when you bite on it, all your teeth meet at exactly the same time in a position where your muscles are relaxed. You may have to wear this all the time or, just at night. If the appliance relieves your symptoms then your bite may need to be corrected permanently. Cosmetic dentistry in Barkingside, Redbridge provides single tooth crown, bridges, inlays, outlays, jaw aches to restore broken tooth to its normal size and shape at dental clinic Ilford, Essex.